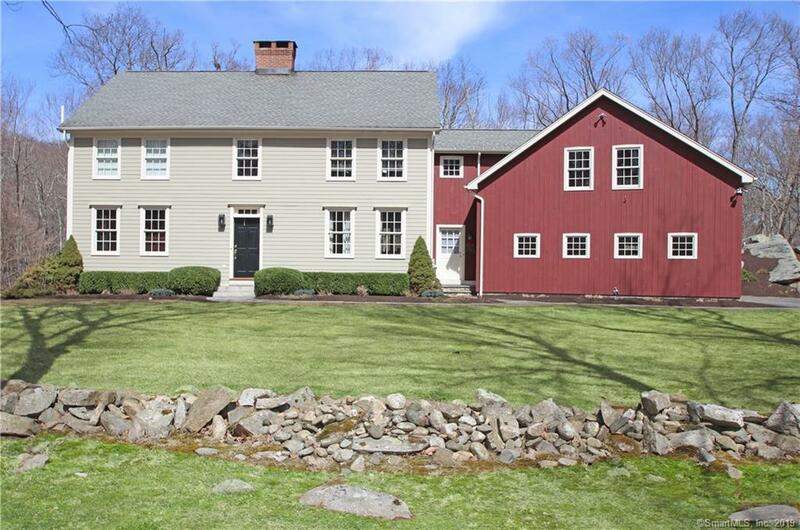 Beautiful curb appeal, this custom built colonial home on over 4 acres. Slate flooring in kitchen, main level bathroom & mudroom with radiant heat in kitchen, dining room, downstairs bathroom and mudroom. Kitchen Island and soapstone countertops which opens to your living area with built-ins and lighting. Large mud room/laundry area. White oak wood flooring with random widths. Surround sound with flush wall speakers in living room. System also features an outdoor zone for patio and front of garage outdoor speakers. All remotely controlled by iPhone on wifi and bluetooth. French doors to large gorgeous patio overlooking the property for an owner to enjoy. On the second level a master bedroom suite with a clawfoot tub and radiant heat bathroom flooring. Two-additional bedrooms plus a large bonus room with closets. House designed with a 4 bedroom septic. The bonus room could easily serve as an in-law or guest suite with its own heat zone and central air with separate staircase. Top notch high efficiency furnace and hot water heater, central air-3 zones along with gasoline generator hookup wired to control panel. Closet organizers installed in mudroom and one of the hall bedroom closet. Wonderful garage organizer system you can not miss. This home is not one to be missed and priced to sell! !, NOT INCLUDED: Patio light on post and 2 bedroom ceiling fixtures, lower level wood stove plus washer and dryer machines. Directions: Westside Road To Saw Pit Hill Road, #30 On Right.